The "Lace Series," which can be found in my recent work, was inspired by the wildly overgrown foliage on the houses of New Orleans. The masses of ficus and cat's claw grow in beautiful meandering patterns resembling lace. In this blog you can see how the pieces are produced. A body of work I have recently been working on is entitled Lace Series. In this series, I was interested in how the vines that grow all over the houses and walls in New Orleans resemble intricate lace. By pairing the vines with an actual lace pattern, I hoping to draw attention to how nature and human design are interwoven. The work developed from a process I was working with in my encaustic paintings that involved cutting stencils. Encaustic painting is done using pigment impregnated beeswax and melting the wax/paint on a hot palette. An artist working with encaustic can layer many coatings of wax on the surface, however, each new layer has to be fused with a heat gun or torch to the previous layer. In the process of fusing it is not uncommon to lose the image. One second too long with the heat gun on the waxed surface and you have a puddle of colored wax instead of the image you had painstakingly painted. For this reason, I started to cut stencils and paint or sprinkle powdered pigment onto the wax. The stencil helped hold the image in place while I fused it. A detail from one of the pieces that I used this process on is the painiting to the left. After I finished this painting, I hung the stencil on the wall and left the studio. The next day when I can back in the stencil, which had been hung haphazardly on the wall, had some wonderful shadows reflected on the wall behind it. 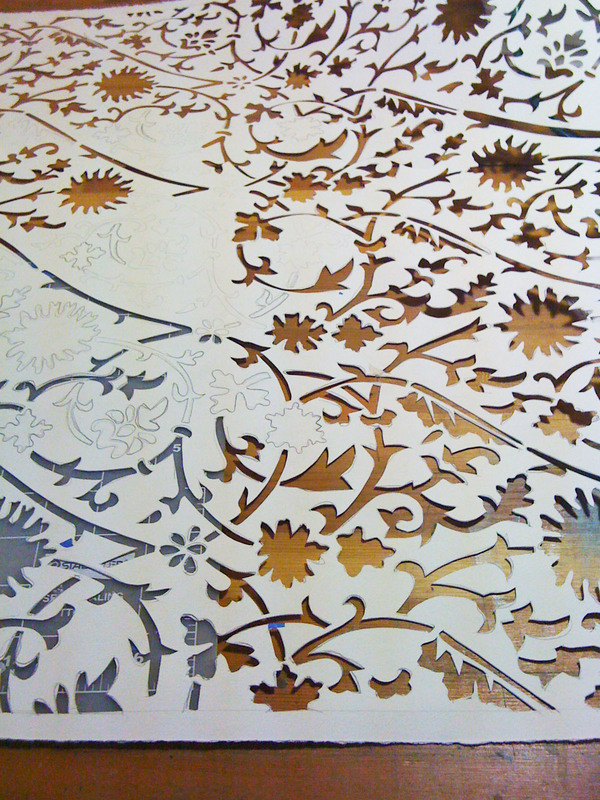 It also looked more like lace in its cut-out, white state, than the painting did. So I decided to try cutting a stencil out of white paper and use the stencil as the final piece. I experimented with many different kinds of paper but I finally found some synthetic paper called Yupo that worked the best. The problem was the paper needed to be stiff enough to hold its shape and not sag Some traditional print paper were not stiff enough, and others did not cut very smoothly. The Yupo did the trick. It also came in a super white color so it looked very much like the white of lace. 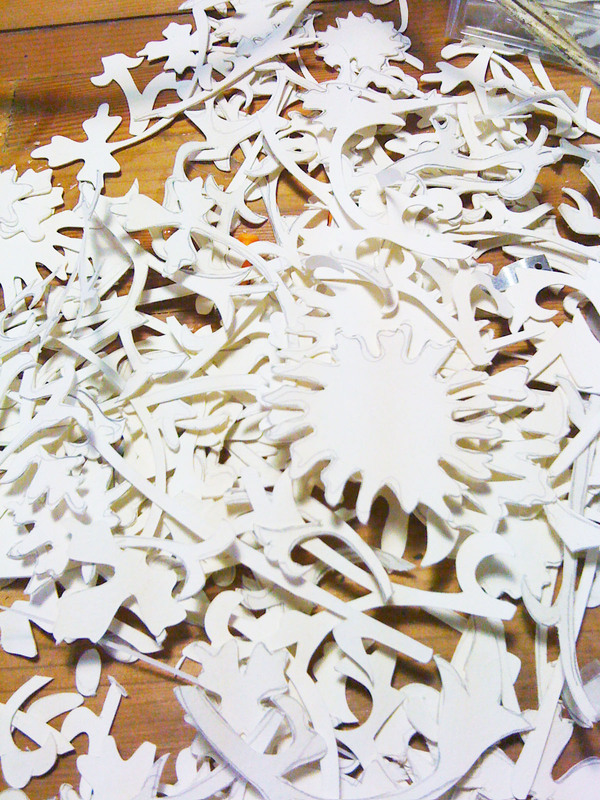 In the pictures below you can see the drawing on the white Yupo and the beginning of the cutting. I had to experiment also with finding the right tool to do the cutting. At first I used and xacto knife, but I could not get the flow and curvilinear patterns to look the way I wanted them to. I finally stumbled on a stencil cutter that works a little like a gyroscope allowing my hand to move with the curves and cut at the same time. I love this tool. Even though it is a craft tool and is not as sturdy as I would like, it really allowed me to get the kind of movement and shape that really enhance the lace and vines. The finished installation can be seen on my website in the gallery section entitled "Lace Series" or, if you are in downtown Baton Rouge, La, it is on display until June 2011 at the LSU Museum of Art.